Since the 1850’s tourism has been a strong industry and popular cultural activity within the United States. Since the invention of automobile and airplanes the industry has continued to grow and still is one of the leading economic industries within the United States. There are many job options available to those who want to pursue a career in tourism as well as an abundance of educational choices for individuals who have a desire to study tourism. In 2010 over 100 million people, including both international students and American citizens, visited and traveled throughout all 50 us states. Currently tourism is a $1.3 trillion sector of the U.S. economy. The U.S. Department of Commerce released a statement claiming that its travel and tourism forecast projects a record of 64 million international travelers who are predicted to spend $152 billion during their visit in the states in 2011. This is a 13% monetary growth from the records of 2010 and the forecast also expects this number to increase by 6 to 8 percent annually through 2016. Due to the large number of travelers and tourists visiting the states there is a high demand for employees in this industry. Tourism is either the first, second, or third largest employer in 29 different states. There are millions of people who have a career in tourism; as of 2004 over 7.4 million people had jobs connected with the tourism industry. International students interested in a career in tourism are able to choose between hundreds of different employment options. Job possibilities can range from travel writer/blogger, travel consultant, marketing and tourism specialist, hotel or restaurant manager, travel agent, etc. and can involve working in the hospitality or service industry along with marketing and public relations as well. Furthermore, there are thousands of universities and businesses that offer degrees and training courses for individuals who want to study tourism or earn certain licensing for a specific job or career within the industry. Schools such as University of Central Florida and George Washington University are known for their tourism and management degree programs and are a popular choice for international students wanting to study tourism. Furthermore there are online travel and tourism schools, hospitality and training institutes, and tourism and travel management schools all over the country. 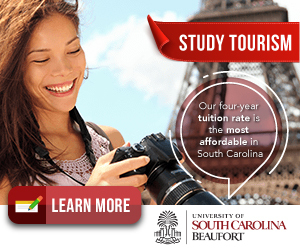 There are also many internships available to students who study tourism. Visit Florida for example, has a paid internship program which allows students to gain experience in several different departments of the company every semester. These departments include creative services, advertising, corporate communications, industry relations, promotions, public relations, and research departments, all of which are involved in developing tourism for the state of Florida. After earning a degree or certification pertaining to the industry, individuals who are pursuing a career in tourism have a plethora of different work locations to choose from. Each state has its own unique features that attract tourists. New York City for instance, is home to Times Square, which as of 2008 is the most visited tourist attraction in the U.S. with 35 million visitors each year. Florida is also one of the top travel destinations in the world with an average of 70 million visitors annually. States such as Colorado, New Mexico, and Utah attract millions of tourists every year because of their breathtaking landscapes and fun outdoor activities. Cities like New Orleans, Louisiana, and Las Vegas, Nevada also attract millions of people every year because of their reputation as top party destinations in the U.S.
Tourism is a great industry to infiltrate due to the high demand for employees and numerous educational opportunities available for international students. Whether you are currently studying tourism or looking for a career in tourism you can be assured that this booming industry will continue to grow in the years to come.